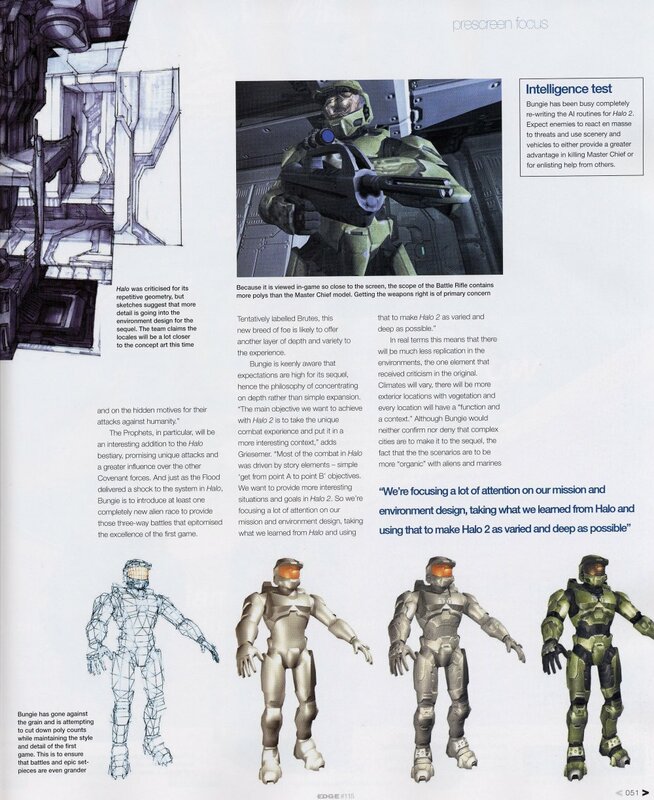 I was reading the Press Scans of Edge's September 2002 Halo 2 article, and it said that Halo 2 will incorporate the three-sided battles (like Flood vs. Humans vs. Covenant) with more alien races... like the Brutes. Does this mean that the Brutes are not all with the Covenant? Perhaps there will be some sort of disagreement between the Elites and the Prophets, resulting in the Brutes and Elites fighting? Other posts and emails have come to the conclusion that perhaps the Brutes are the personal bodyguards of the Prophets. If this is true, I wonder who exactly the Hunters, Grunts, and Jackals are going to follow? The article's wording is somewhat ambiguous, but the possibility remains. The Brutes seem to occupy a unique niche within the Covenant hierarchy: temple guardians and protectors (a seemingly important post), and yet the Elite guard is shocked that a Brute (Tartarus) is allowed to approach the High Prophet. And what of their scheming, behind closed doors as well as the backs of the Elites themselves? If the Elites do develop a problem with their present "arrangement" with the Prophets, and the Brutes (like Tartarus) back the High Ones, we may be in for some real mayhem. We've been looking forward to fighting alongside Spartans in Halo 2, but with (and against) Elites as well!? Halo-John was witness to the Holy Light other Spartans found in the mines of Reach. The Bible- John was to bear witness of the light. Hmmm... John 117 the Baptist. It does add more credibility to this particular connection. Which are good? Which are bad? Many medieval myths and legends speak of a supernatural swordsmith, who has had the names (among others) Wayland, Wieland, and Volund. He was referred to on the Halo Story Page as Ogier. Volund the swordsmith made other blades as well. These included Tizona (wielded by El Cid of Spain), Mimung (wielded by Dietrich of the Osthogoths), Balmung (wielded by Sigmund of the Norse), and, most importantly in this situation, Joyeuse (wielded in different legends by Sir Lancelot du Lac of Arthurian fame and Emperor Charlemagne). We are told in the Song of Roland that upon the blade of Durandal was written "I am of the same temper as Cortana and Joyeuse". Two of these three swords have been featured in Bungie games as independant and possibly (definitely, in Durandal's case) rampant AI's. Can we expect to see a third in the future? If Bungie indeed intends to continue this pattern (we all know how dearly Bungie loves story patterns), then maybe Joyeuse will make his/her appearance in Halo 2 (hopefully) or another game. P.S For those who are interested: the elvish swordsmith should not be called Ogier (I think), because that is the more well-known name for the Danish hero Holger Dansk. The dead, saints, Mary, the Christ, etc. Just a couple random thoughts concerning Trautmann's question, "Who or what would wear a halo?" Maybe we shouldn't be thinking of who or what wears a halo, but instead, who or what wears a ring? All kinds of people wear rings. Maybe Installation 04 is a wedding ring, and it's been left behind by the Forerunners right before they crossed the "Threshold" (that gas giant in the background)? Who knows. Ask an ambiguous question, get an ambiguous answer. "And I'm gratified that some of the more subtle stuff I finagled into H:FS doesn't look like its been stumbled upon. Hm. Perhaps a hint is in order. Who or what would wear a "Halo"?" The title taken by Thr?in I, founder of the Dwarf-kingdom at Erebor, the Lonely Mountain, and maintained by those Kings of Durin's Folk who dwelt there. The line was broken twice, once by Thorin I (he and four generations of his descendants ruled from the Grey Mountains, not Erebor), and once by the dragon Smaug (who claimed the title for himself). In both cases, the line was restored to a rightful heir. In both cases, the line was restored to a rightful heir. (Going out on a limb...) This could very well be a reference to the Master Chief--I'm willing to bet (not a large sum of money, mind you, but still bet)--aka "The Reclaimer". Since Guilty Spark has clearly seen the Master Chief/John-117 or someone like him before, is it possible the the Master Chief is the second rightful heir--the second reclaimer? Excellent. How then, if at all, could this relate to the Covenant's "Ninth Age of Reclamation", a line with obvious portent and relationship to the Master Chief's title? In Mark chapter 3, Jesus appoints the twelve apostles. Concerning Halo, I find it odd that John is mentioned in a secondary manner. Perhaps there will be an important role to come for our MIA pal James. Last night I was just running through the multiplayer maps again, and noticed the description of the level Chiron TL-34 which we've all seen a million times before... it said Spartan CLONE training facility. 2) The information Halsey found in First Strike really was the discovery of a new Spartan-cloned team. ONI or the UNSC or both made those flash clones of the original Spartans in order to quickly hand them back to their parents before too much suspicion arose, but why would they (ONI, UNSC) waste money on a special training facility when they obviously didn't particularly care too much about the flash clones in the first place? I'd go out on a limb and say that Ackerson (the guy that stole the genetic information of the Spartans) probably got the DNA of the Spartans that showed extraordinary skill in one task or another, meaning since Kelly was the fastest of the Spartans, he got her speed. Presumably this would also mean that he would get whatever was in Linda's genes that made her the best sniper for the team, and maybe he even got the information in Sam's genes (may he RIP... or not?) that caused him to be the strongest. This clone reference may or may not be of the same ilk as another point brought up concerning this level: If Chiron has teleporters, does that mean that Humanity possesses teleportation technology, or is it merely a matter of gameplay? If Halo kills any organism with sufficient biomass and cognitive ability then what happens to organisms that have insufficient biomass and don't have cognitive ability. When Halo was fired long time ago it killed all life of sufficient biomass but it spared the insufficient biomass life forms (kids, baby's etc. ), because flood would not mutate life forms that are weak and small. If my theory is true then it might explain why 343 GS says "I am grateful to see that some of them survived to reproduce". Stop Cyborg Exploitation Now! Fair Wages! Union Equity! At the end of Halo, 343 Guilty Spark is shown to be alive, in space. There has been speculation about what he will do now. After realizing that your plan to neutralize the Flood was successful, he would hold no grudge against you, being an AI." Even though this goes back into Marathon history, I think my point is still quite relevant to the Halo story line since it is about AI constructs. If you recall poor, Tycho. Betrayed by Durandal, handed over to alien hands, studied, probed and disected; he seemed a little upset after all was said and done. He forged P'fhor military IDs, called in several vessels of the P'fhor navy and sent many, many soldiers to their death all for his revenge on Durandal. I may be out of step, but it sounds to me like Tycho may have been holding a bit of a grudge. As for the flood being neutralized...who said that? I saw Halo blow up, but his mission was to assure that they would never escape the installation. It's quite clear how "adaptable" the flood are. And if simply blowing up the ring was enough to finish them, why rig the thing to take out a whole galaxy? Everyone seems to assume that 343GS left Halo because his mission was complete. I think he failed. And if I was an ancient construct with a failed mission objective and a fervish interest in Human/Forerunner history, I know where I'd go and I know the first person I'd look up when I got there. Bungie's AI's seem to have a nasty habit of abusing cyborgs for their own means. Plus...343GS is just what the MC needs to get from planet to planet quickly in Halo 2. But that's just me dreaming again. Not to mention that the Flood may be extant in more than a single location in the galaxy. A disconcerting truth for us, and for 343, one that may require urgent monitoring.